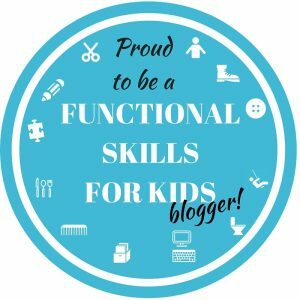 This month’s topic in the “Functional Skills for Kids” blog hop is the Personal Care, so check out the landing page for the rest of our posts and information on all things related! Children with special needs CAN be taught to be more independent. This is important for their quality of life, as well as yours. Some parents dig in even harder to do everything for their child with special needs. Let’s Face it, You won’t always be there for them. 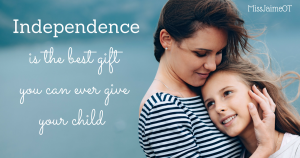 The most important gift you can give your child with disabilities is independence. Basic personal hygiene and bathing are one of the most difficult daily tasks for a child with special needs. Another problem is that disabilities such as Autism Spectrum Disorder, Down’s Syndrome, Tourettes, or Developmental Coordination Disorder are usually accompanied by other diagnoses. 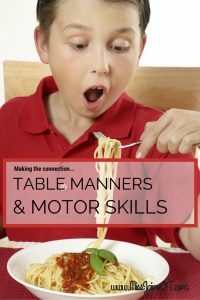 These disabilities often are linked with intellectual disability, obsessive compulsive disorder, motor planning dysfunction (apraxia or dyspraxia), attention deficits and/or sensory processing difficulties. 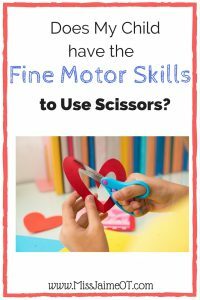 Children with special needs may have gross motor delays that impact their balance and coordination. Fine motor tasks like opening the shampoo can be frustrating. 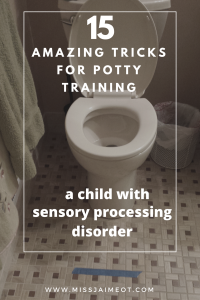 Sensory processing issues may cause distress with the running water, the echoing sounds of the tile, and the sensation of shampoo in their hair. There are so many different aspects of showering to consider. Check out this post by Your Therapy Source for a complete task analysis of bathing. 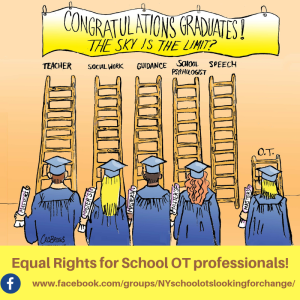 DoEs a Child With Special Needs even stand a chance? Research shows that in instances where the child’s delay impacted the whole family, parents had a tendency to take over in order to save time during ADL tasks (Van der Linde, et al., 2015). I’ve seen it first hand and I catch myself on the verge of jumping in to help once in a while. But too much help can hurt in the long run. No one is saying it’s a simple task. But, bite the bullet and start teaching them step by step how to do it on their own. Here are my sure-fire tips for helping your child get started on a showering routine. The sooner you start, the sooner they are independent! Put all your child’s soaps, shampoos, deodorant in one caddy or plastic box. This way everything is one place. 2. You may want to consider giving each family member who will use that shower their own caddy. This will limit your child from accidentally using baby oil instead of shampoo, etc. 3. Establish a self-care routine and stick with it. Many children with special needs thrive with a routine. You can gradually fade yourself from the picture as your child grows more independent. 4. Use a picture app such as PhotoMind to remind your child or the routine. 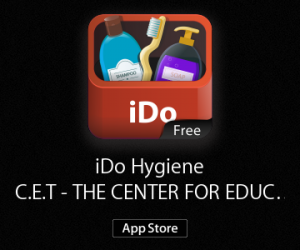 Or try the free app called “iDo hygiene”, which addresses all the basic personal care tasks. 5. You can also use the apps “iDo hygiene” or “Making Sequences” to take pictures of each step to review prior to the shower process. 3) Turn on the water and make sure it’s not too hot. 4) MAKE SURE THE SHOWER CURTAIN IS ON THE INSIDE! (we’ve all made that mistake! 5) Wash your body – a picture of the soap he uses. This may seem unnecessary, but after reviewing it a bunch of times, it becomes second nature. Children with special needs thrive on routine. They may flip through quickly, but it will help them remember all the steps. The bathroom door should stay unlocked or slightly ajar in the case of an emergency. The shower curtain must be on the inside. If you have a faucet or one knob shower, try using bath chalk or crayons in red and blue. Then, you can write HOT and COLD or draw a picture to help your child understand. If your child has difficulty with balance, you may want to consider adding grab bars in your bathroom. You can get temporary ones that don’t crack the tile. It’s a good safety measure to prevent your child from falling or from getting in the habit of grabbing the curtain or the glass door. For a child with coordination and balance issues, you may want to get a non-stick mat or even a shower chair. Or, get your child in the habit of sitting down (depending on your child’s level of physical disability). There are a few ways to cut down on wasted shampoo and soap, especially for our impulsive kids who love to squeeze as hard as they can (or repeat a process three times) before they are satisfied. Give your child a plastic tablespoon to keep in his caddy. Teach him or her to measure out only one tablespoon of shampoo, conditioner, and body wash. Choose shampoos, conditioner, and a liquid soap that have a small spout instead of a large opening. OR Use shampoo, conditioner, and body wash that come in a pump. Next, teach your child to use “one pump” only. Choose your child’s brand of soaps, shampoo, and conditioner and stick to that kind. If possible, buy brands that have different color bottles (shampoo is a white bottle, conditioner is brown, etc.). Eventually, your child will learn which bottle is which and stick with his routine. 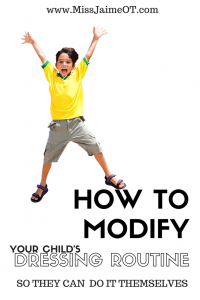 Find a way to get your child with special needs used to a time constraint. You can put a timer in the bathroom that goes off after ten minutes. I like a Time Tracker that lights up and has programmable sounds from Amazon, but you can even use a simple egg timer. If you look on Amazon, there are ghostbuster timers, cow timers, princess timers. You can definitely get your kid excited about the timer if you find the right one! Or, you can use music to set the pace. When the song changes, go to the next step. This can help kids who don’t wash for long enough or vice versa. I recommend that you don’t leave your phone in the bathroom, though! Try a little water resistant speaker with Bluetooth and hook up your phone from outside the bathroom or just use an old fashioned cd player. Does anyone have those anymore? For kids who don’t wash the soap out of their hair, teach them to check the water at the drain before they get out. Are there still bubbles? Then they need to rinse for another song. If your child has a really hard time with this, try using hair “spray paint” that they sell at Halloween time. Spray their hair a funky color and then show them how it washes down the drain. When the water is clear, they are done rinsing. iDo Hygiene allows families to learn daily life skills with video modeling and fun games, for individuals with special needs. Making Sequences can help a child to learn the parts to a story or a task to help them perform tasks properly in the correct order with more ease. Hauser-Cram, P., Warfield, M. E., Shonkoff, J. P., Krauss, M. W., Upshur, C.C., & Sayer, A., (1999). Family influences on adaptive development in young children with Down syndrome. Child Development, 70, 979-989. Van der Linde, B., van Netten, J., Otten, B., Postema, K., Geuze, R., & Schoemaker, M. M. (2015). Activities of daily living in children with developmental coordination disorder: Performance, learning, and participation. Physical Therapy, 95(11), 1496-1506. This post is AMAZING! You have provided so many excellent suggestions and tips for teaching children with disabilities to become independent with bathing. My personal favorites are the ideas to use a caddy for everyone in the family and the only use one pump. So many wonderful ideas and tips! I haven’t seen these apps before. They look really useful. I love the idea of using a tablespoon measure for the shampoo. When I read about the different coloured bottles, I instantly thought of a travel set that I have where I transfer from my “large” bottles into these for travelling. A system like this might be helpful to those kids who have trouble with transitioning to different brands (ie. If the shampoo/conditioner/soap are dispensed into coloured containers for regular use). So true! Different color bottles take away the task of “reading” to see which bottle is which. A WONDERFUL post Jaime! Thank you!! So comprehensive and practical! Excellent resource, as always. 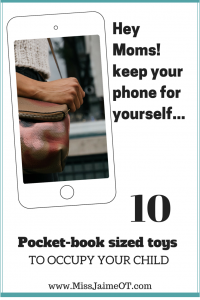 So many practical and easy suggestions for parents! I love the idea of matching shower duration/routine to music! 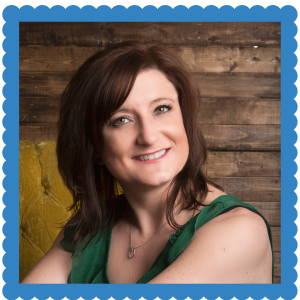 Thanks, Christie – I love to use music as much as possible! 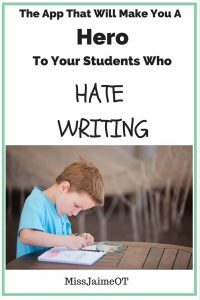 I love the fun tips that kids will really get into! 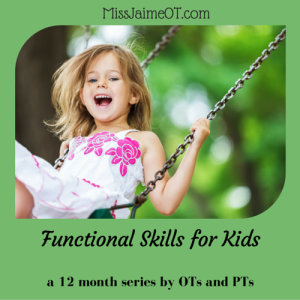 Thank you for another great resource for parents and therapists! I really like how this article explained that occupational therapy can help the whole family since the delay in a child will affect the whole family. That is something I never thought about until this article. 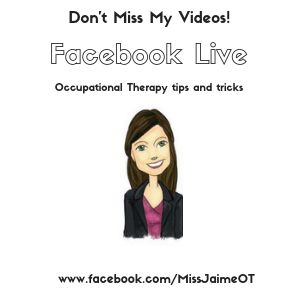 My sister has a child that is a little delayed and may need to start occupational therapy. This article will be something for me to show to my sister so that she knows how beneficial it can be. I really appreciate with your suggestions. I will have to try those in my house from very next time. If you had more insight i will greatly appreciate it. Thanks for the sharing such a informative article. Hello Jaime. Thank you for sharing that great tool with us! As my family has a disable person who teaches the best lesson from this. Please keep it up.